Do you believe there are ghosts and demons and Diviners among us? As Evie jumps headlong into a dance with a murderer, other stories unfurled in the city that never sleeps. A young man named Memphis is caught between two worlds. A chorus girl named Theta is running from her past. A student named Jericho hides a shocking secret. And unknown to all, something dark and evil has awakened…. 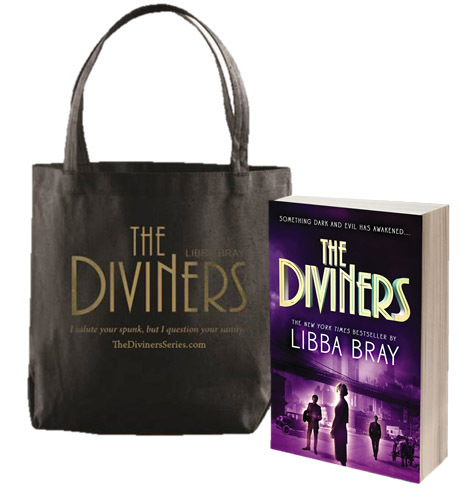 Libba Bray’s New York Times bestselling Diviners is now in paperback. And we hear there’s going to be a second book next August so stay tuned! I’m super excited to be able to offer you guys this very cool giveaway thanks to Little, Brown publishers! 1. I love Libba Bray! I’m most excited to read a historical fiction book! I love that genre but I haven’t come across a book that incorporates it in this way so I’m really looking forward to that aspect. I’m most excited because it’s set in the 20s and I’ve heard that there’s a ghost story too. It sounds like such a great book and I’ve only heard good things about it. I read The Diviners last year when it came out, but I really want to do a re-read as a refresher before the sequel comes out! I really enjoyed the period setting and want to see what else Evie gets up to in the 20s! The first time I read Libba Bray was right after she published ‘A Great and Terrible Beauty,’ and I loved it. She has such a rich voice for historical fiction and I have a feeling it’ll match perfectly with the 1920s setting. Also, if I ever have a little girl, I’m totally naming her Evie. ;) Thanks so much for the giveaway! I’m looking forward to the 1920’s setting and slang! Well, first of all, I love Libba Bray! I also haven’t read much from this time period, so that’s exciting! My friend really loves this book and how it’s written so I’m excited to read it because of that. I love Libba Bray’s books and this one sounds amazing! I love to read anything by Libba Bray! I ♡ Libba Bray & the 20s! Oh, and the Diviners was awesome.